We must experience only the eternal bliss with the jîva and not the worldly things. We must perform good actions with the body and must have good promptings by the mind. It is only such things that please God and draw forth His Grace. Here is a small example. There is a big wall-clock. There are three hands on it. One is a second hand, another is a minute hand and the third one is the hour hand. The second hand travels very fast, moving round the 12 numbers in 60 seconds, while, during this time, the minute hand moves through only the little mark or division. After the minute hand travels through sixty divisions, the hour hand moves through one hour. Sixty seconds make one minute and sixty minutes make one hour. Because the second hand and the minute hand travel relatively fast, we are able to see their motion. Because the hour hand travels slowly, we are not able to see its movement. In the same way, after we perform a number of good deeds, the mind reaches a good place; when the mind thinks of a number of good thoughts, the jîva reaches the holy place of âtmâ. We are able to see the body-acts reaching the jîva (individual soul), but not the acts of the jîva reaching the âtmâ. Our body is like the second hand. Our mind is like the minute hand. Our life is like the hour hand. Therefore, we must do a number of good deeds through our body. We must contemplate over many good things with our mind. Only then, can we reach the holy place in the jîva-tattva. These are called the gross, the subtle and causal states. When we want to reach the causal stage, we must do many good things with this gross body and contemplate many good things with the subtle mind [see also Tempometer: Calculation help for setting a clock to the sun]. Nothing ever happens without proper cause, however accidental or mysterious it might appear. The roots go deep and are out of sight. I was telling J. Hislop (author of 'My Baba and I') in Bombay at Dharmakshetra the same thing. The bridge towards Lanka was being built over the straits so that Râma and His army could march across to the realm of the demon King Râvana, where Sîtâ was interned. The valiant monkeys were plucking mountains and leaping vast distances in space with those peaks hoisted on their shoulders, so that they could be thrown into the sea to create a passage for Râma! The monkeys had formed a queue all the way from the Himalayas down to the southernmost point, where the bridge was fast coming up. When the causeway was completed, word went fast along the queue that no more hills are needed and each monkey placed on the ground, wherever it stood, the hill it had on its shoulder at the time. One hill, however, did not sit quietly. It started bewailing its fate! "Why was I removed from where I was and why am I now refused? Alas! I was elated that I am destined to serve a divine purpose; I was overjoyed that the Armies of Râma and Râma Himself will walk over me. Now, I am neither there, nor where I was!" It shed profuse tears. News reached Râma, and His compassion was great. He sent word that in His next avatâr, when He will come again upon His mission in human form, He will certainly bless the sorrowing hill. 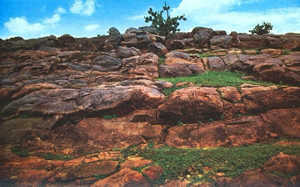 This was the Govardhana Peak which the Lord (as the boy Krishna, see S.B. 10:25, B.V. ch. 35, ch. 38, & RRV. ch. 7a) lifted on His finger and held aloft for full seven days, in order to save the cowherds of Gokul from the deluge of rain that Indra dared to inflict on them! Those who are too weak or unsteady to go through the prescribed discipline bring all kinds of lame excuses, when charged with malingering. A farmer's dog was a fierce animal; it leaped towards a visitor with bared teeth and would have bitten him, if not for his timely discovery a thorny stick on the ground was picked up, with which he hit the dog on the head. The dog retreated howling in pain; the master heard it and got wild at the visitor for inflicting wounds on the dog's head; he dragged him to the Royal Court. The King asked him why he had beaten the dog which according to the farmer was quite a harmless pet. The visitor said that it had actually leaped at him and bared its teeth. The farmer said that this did not justify his using a thorny stick; he could have used a smooth stick instead. The visitor reported that when one is anxious about saving his life which is in jeopardy, one has no time to discriminate and pick and choose; he has to use what his hands find. Besides, he asked, "Why; the dog could have threatened to bite me with its tail; when it bites with the teeth, I have to reply with something equally sharp". The Râja appreciated the point of the visitor and he was acquitted. Because it was his pet, the farmer resorted to all these tactics; the visitor had to use counter tactics. Straight dealing could have avoided the bother. 131. "Is That Real" or "Is This Real"? Reality can be grasped in a flash of illumination, as happened to Emperor Janaka. One evening, Janaka was in his Durbar Hall, surrounded by his courtiers and a bevy of female musicians; they sang sweet melodies and the Emperor enjoyed the music so well that he slept off, while on the throne. No one had the temerity to wake him; they all quietly slipped into the inner apartment, lest their talk and movements might disturb him. He was left alone with an attendant, and the queen. At about midnight, the Emperor screamed pitiably and awoke at the sound. His queen ran towards him. The Emperor asked her, "Is that real?" She could not find an answer to this question, for how could she know which was that and which was this? The Emperor asked everyone the same question; in fact, he spoke no other word. That question was continuously on his lips. News spread that Janaka had gone mad; there was mourning everywhere. A sage who heard of this came to the palace and was brought to the Imperial Presence. He assured Janaka that he would answer his question, provided he told him what he saw in his dream, while sleeping on the throne and why he screamed so. Janaka had a dream. He dreamt that rival kings had joined forces and invaded his dominion and captured his capital and that, to save himself from them he ran into a forest. Fleeing from his foes, he had no food for days together. He was too exhausted to move. But, hunger dragged him on. When he came to the outskirts of a tribal village, he saw a man washing his plate after taking food; he shouted to him asking for a few particles. The man gave him a small morsel, but, as bad luck would have it, a crow flew in at that moment and snatched it away! That was the reason why he screamed in agony. That was why he asked, "Is that real or, is this real?" The hunger was as real as the throne; ruling over the Empire is as real as the loss of empire was in the dream. The sage told him. "That is unreal; this too is unreal. That was a Swapna, this is Jagrath, both are Mithya (not false, because they are relatively real; though not absolutely real they have temporary reality, a reality that is negatived by subsequent investigation and experience). But, you dreamed, you woke, you screamed, you asked; therefore, you existed during both stages; so you alone are real" . The "I" that persists in all the three stages -- waking, dream and deep sleep -- that "I" is the only reality; it is the "I" that appears as all this manifested Universe. 132. How Far is Vaikunthha? Provided your intellect is sharp and free from prejudices and predilections, the reality will reveal itself to you in a flash, for it is quite a simple thing. Only, it must be capable of seeing the problem in its basic essence, apart from all the jumble of irrelevancies. Once a very learned pundit was holding forth in a very pedantic manner the story of Gajendramoksha from the Bhagavatha (see also S.B. 8.2: 4), before the Mahârâja in his Durbar Hall, before a large gathering of courtiers. He described how the Lord, on hearing the agonised call for succor from the elephant held by the jaws of the monstrous crocodile, hurried from Heaven (Vaikunthha) without stopping even to collect His insignia and weapons, without even intimating to His Consort where He was bound to and on what mission. Suddenly, the Mahârâja interrupted him with the question. "Tell me, pundit, how far is this Vaikunthha?" The learned pundit did not know the distance; he was non-plussed. Nor did any of the other scholars in the palace know. But the servant who was fanning the King from behind the throne offered to furnish the answer, if his impertinence be pardoned. The pundit was shocked at his effrontery, but the Mahârâja allowed him to speak. "Your Majesty! Vaikunthha is as far as the cry of the elephant could be heard", he said. Yes, when the anguish of a devotee's heart is expressed as a cry or a groan or a sigh, the Lord is as far only as that sound could reach; He is always on the alert to listen to the cry of His children. His Residence, Vaikunthha, is within hearing distance of every cry, from every grief-stricken heart. That illiterate servant knew in a flash the Omnipresence and the Compassion of the Lord. Man must reveal the divine qualities of love, humility, detachment and contentment; if he does not he becomes worse than a beast and more deadly. There was a dog that pleaded with Râma for a place in the aerial car in which He returned to Ayodhyâ. When Râma asked the reason for this strange behavior and request, the dog said that man had become worse than worms and fleas; man had started tormenting dogs who were loyally serving him. One should so live that no pain is caused to other beings through one's activities. And, one should be ever grateful for kindness received. Kârtavîryârjuna was treated with lavish hospitality by Jamadagni, but the wicked man coveted the Kâmadhenu that made the lavishness possible [see also Summer Showers in Brindavan-7 and S.B. 9:15]. Bharthrhari, on the death of the queen, was so struck with remorse that he wept and moaned on the cremation ground itself for days on end. Seeing his inconsolable plight, one sage came before him, with a mud pot in his hand. Right in front of the bereaved man, the pot slipped from his hand, fell on the hard ground and was broken. The sage wept and moaned and was inconsolable. Bharthrhari consoled him and said, the broken pot cannot be made whole by any amount of lamentation. Suddenly he realised the absurdity of his own behavior and stopped crying; this was the purpose of the sage's ruse! You come to Parthi, listen to these discourses, nod approval and clap hands in appreciation. But when you pass through the gate on the way home, it all evaporates. Or, you apply the lessons you learn in an indiscriminate way and suffer. There was a merchant who used to attend discourses and when he heard a speaker say that cows should not be driven off while they are feeding, he looked on, when a cow entered his shop and ate off a good portion of the grains he had kept for sale. Later, he was told that he should not take every bit of advice he received as valid for all occasions. He advised his son: "Look here, you sit on the floor on a towel while listening to the discourse, is it not? When the discourse is over and you rise up, do you not wave the towel forcibly in the wind to shake of all the sand it collected? Shake off from your mind and brain all the ideas and advice you have collected during the discourse and then, come home." If you do as that merchant advised, what is the benefit of coming, staying, hearing and being exhorted? When you attempt to deceive another, remember there will emerge some one who can deceive even you. There was a thief once who was skilled in all the stratagems and tricks of that profession. There was not a single one that he had not mastered. One day, after collecting a large number of costly articles and bundling them up, he was moving along a lonely road with the booty on his shoulder. He saw a child standing on the bank of a wayside tank, weeping aloud, in great distress. The thief went near and asked, "Why are you weeping? What has happened to you?" The child said, (and here, you have to remember that it does not matter how old or how young a person is; it is the intelligence that matters). "I came here for a bath; my golden necklace fell into the waters, right there, where I tried to have a dip. The place is too deep for me." The thief thought that he could get away with this necklace too, for it was a little child that stood between him and the jewel. So, placing his bundle on the bank, he went down into the waters to retrieve the necklace. Meanwhile, the child lifted the thief's bundle and running a short distance, disappeared into the jungle. The thief came up disappointed, for the necklace was but a fiction, only to find that he had been robbed! Who ever deceives another will have some one cleverer to outwit him. There was a famous dacoit once who advised his son while initiating him into the ancestral profession, never for a moment to listen to stories of the Lord. "Do not stay to listen to any Purâna or any reading of the Bhagavatha", he exhorted the young aspirant. The son scrupulously observed this injunction for years and amassed a good fortune. One night however, while running with his loot on his shoulder through a side lane of the city to avoid the police, a peace of glass cut his sole; he sat for a while to pull it off and stop the flow of blood. He was then behind a house, where some one was reading and explaining the Bhagavatha to a small group of listeners. He listened perforce for a short two minutes. The spark fell on the heap of cotton. During that short period, he heard the pundit explaining the nature of God. He has no ears, no eyes, no limbs: he has a thousand forms; He is without form. "sarvatah pâni-pâdam", as the Gîtâ [B.G. 13:14] says. That description got fixed in his heart. He could not shake it off. A few days later the police came to know of the depredations made by him as well as his associates and kinsmen. In order to know more about their activities they entered the area incognito; one constable as Kali and some others as the worshipers and priests. They shouted and yelled, cursed and terrified the dacoits and called upon them to come out of their homes and fall at the feet of Kali. Many did so, but the son who had heard the Bhagavatha, albeit for two minutes, knew just enough to save his skin. He was not terrified at all. He challenged the constable who was acting the role of Kali and tore off his make-up and exposed the plot and instilled courage into hearts of the gang. Then, when the police left discomfited he argued within himself thus: "If two minutes of the forbidden fruit could help me so much, what can I not gain, if I devote myself entirely to the stories of the glories of God?" He left off the evil path and became a Sâdhaka. Once upon a time, a monk wearing the ochre robe chanced to enter a village full of atheists; he fell in with a gang of defiant youth who challenged him to show them that the God whom he was adoring actually existed. He said, he can, but before doing so, he asked for a cup of milk. When the milk was placed before him, he did not drink it; but, sat looking at it, long and silently, with increasing curiosity. The youths became impatient; their clamour became insistent. The monk told them: "Wait a minute. I am told that there is butter in milk; but, I must say this cup does not have it, for, I do not see any of it, however hard I look into it!" The fellows laughed at his innocence and said, "silly man! Don't rush into such absurd conclusions. Milk has butter in every drop; that is what makes it so nourishing. If you must see it as a separate concrete entity, you have to boil the milk, cool it, add sour curd, wait for some hours for it to curdle, then, churn it and roll the butter that floats into a ball". "Ah", said the monk, "that makes my task of showing you God much easier! God is in everything, being, atom of the universe; it is because of this that they exist and we can cognise them and enjoy them. To see Him as a concrete entity, you have to follow a prescribed procedure, earnestly, strictly and sincerely. Then, at the end of it all, you can experience His Grace and His Glory." A wicked man once went to a Guru for initiation into spiritual life. The Guru asked him to give up at least one of his bad habits; he gave up uttering falsehood. That night, when he went to the Royal Palace to commit theft, he found on the terrace another person, who said, he too was a thief. He too announced that he was a thief and both broke into the treasury and divided among themselves the diamonds found there. The other person was none other than the king; he pretended to be a thief and he knew where the keys of the treasury were. While the diamonds were shared, the honest thief felt pity for the king of the realm who was losing his entire stock; he asked his companion to leave one diamond behind in the safe. And, it was done. Next morning, when it was discovered that the treasury was looted, the Minister was sent by the King (who had acted as thief the previous night) to assess the loss. The Minister found a diamond that had missed the eyes of the thieves. He quietly transferred it to his own pocket and reported at court that all the diamonds were gone! The King had got from the honest thief his address the previous night while they parted company, with their separate bags. So he sent for him and when he stood in court before the King, he confessed that all but one of the diamonds were stolen by him and his unknown associate. The diamond was discovered in the pocket of the Minister and the King dismissed him for the lie. The honest thief was appointed Minister instead, and he gave up his other evil habits too and pleased his Guru, by his fame as a virtuous administrator. The Pândavas celebrated the As'vamedha-yajña, and as part of that ceremony released the chosen horse so that it may take its own course across the length and breadth of the land. Whoever stops and binds the horse is thereby challenging the sacrificant for a fight; he has to win back the horse, after defeating the audacious obstructionist. Mayuradhvaja, a great devotee of Krishna, a virtuous ruler, a wise man learned in the Vedas, a man of deep compassion, held the horse, and Arjuna, the Pândava hero, decided to meet him in battle. But, Krishna advised him to desist; for, he desired to demonstrate to Arjuna the devotion of Mayuradhvaja which far surpassed his own; he also desired to proclaim to the whole world the heights that Mayuradhvaja could reach in the realm of self-sacrifice and truthfulness. So, He proposed that He and Arjuna proceed to Mayuradhvaja's Palace in the guise of a pair of brahmins, seeking a meal. They were welcomed by the King, who offered them rich hospitality. But, before they could eat the very first mouthful, Krishna stopped very dramatically and recited a tale of woe. "Listen! O soft-hearted Emperor! As we were coming along through a forest on the border of your empire, a tiger snatched away the young son of my companion here. Before we could come up with the beast, it had swallowed half the body; but, it heard our piteous appeal, and promised to release the boy, and return him alive to us, provided it is given as substitute, one half of the sanctifying body of the pure and holy Emperor of the land, Mayuradhvaja. How can we relish your hospitality with this agony in our hearts? Promise to give the tiger half your body in exchange for the full living body of this brahmin boy, and then, we shall partake of your hospitality". Mayuradhvaja agreed most gladly; when the lunch was over, he sat on the floor and instructed his queen and his son to saw his body into halves. They placed the saw on the head and began the process of division, with the brahmins witnessing the operation. Drops appeared in the left eye of the King. Krishna said, "O! You are giving us the promised gift with tears, not with unalloyed willingness. I cannot accept anything given with tears". But Mayuradhvaja replied, "Sir! If I am unwilling or hesitating, both eyes should shed tears, shouldn't they? Only the left eye is shedding them now; and the reason is this. The right half is being used for a highly sacred purpose, to save a person from cruel death. But, what will happen to the left half? Cast away, to be eaten by dogs and vultures? So, the left half is weeping, but, the right half is jubilant that it is being put to some meritorious purpose". At that moment, Krishna manifested Himself to the great Mayuradhvaja in all His glory and majesty; Krishna blessed the King that he would have Him always installed in his heart and that he would be ever blissful and content. Arjuna too realised that there were devotees of Krishna far more advanced than he was. His pride was humbled. Mayuradhvaja's humility was rewarded. A clever villager used to enter the village temple in the early hours of the day and sit on, with eyes closed, in the hope that people will honor him as a great devotee. Since he did not get up and go about his business until about midnoon, the temple priest was hard put to it to close the doors and go home for his daily tasks there. So he struck upon a plan to stop the nuisance. He knew that the closed-eye session of dhyana was all a pretence. He hid himself behind the idol of the deity, and when the villager was well set in his pretence of deep meditation, he said, in an imposing sonorous voice, "Listen! Excellent Devotee ! I am mightily pleased by your asceticism and your steadfastness. Come I shall merge you into Myself." At this, the fellow ran fast out from the temple, leaving no trace of where he had gone to! The devotion and sense of surrender of men are similar to those of this impostor. Faith is weak, discipline is absent; earnestness is lacking. The armies gathered by the Kauravas from their kingdom and from their allies were standing face to face with the forces of their Pândava cousins. Cavalry, elephantry and infantry, eager to start the destruction of the enemy, the chief actors all accoutred and equipped for the fray! Conches were blown; trumpets rent the sky with their blare. The air was tense with hope, fear, anxiety and anger. Blood in million bodies became redder and warmer; hearts pounded quicker: arms grasped weapons in deadly grip. Dharmaja, the eldest of the Pândava brothers, suddenly, removed his footwear; he laid aside his armor. He slid from his chariot and walked towards the opposing cohorts, towards Bhîshma, the Generalissimo of the enemy forces. Duryodhana, the eldest of the Kaurava brothers, the cousin most responsible for the war, the unyielding opponent of the Pândavas, saw Dharmaja cross over to the aged Bhîshma. He was overjoyed; he guessed that Dharmaja had decided on surrender for he was by mature against bloodshed and battles. The four brothers of Dharmaja were astounded. Bhîshma, the redoubtable hero of a hundred contests with the Kauravas, the person most eager for the battle to begin, felt foiled of victory. He recalled the many occasions when Dharmaja had stood in the way of revengeful action against the Kauravas. He feared that he would apologise and withdraw like a craven from the bloody gamble of war. Arjuna, the formidable bowman, witnessed his brother's defection with horror and anger. Nakula and Sahadeva, the twins, were struck dumb at their helplessness. Lord Krishna studied the situation from the seat of the charioteer on the chariot of Arjuna, which was in the front line of the Pândava army. He signed to the four of them to follow their eldest brother and do likewise. He said, "All these years you have revered him, and trod on his footsteps. Do so now. Do not hesitate; do not doubt." Dharmaja was the very embodiment of Dharma, he knew the right and he practised it whatever the consequences. He knew that Dharma will guard those who follow Dharma. He never did a hypocritical or a non-vedic act; he never took a wrong step. He went straight to Bhîshma and fell at his feet. Standing before him with folded hands and bowed head, he prayed, "Grandfather! We had no chance to experience the love of the father; he passed away too soon. You brought us up from infancy with love and care, and made us what we are today. We have no right to fight against you; but, fate has conspired to bring us now into battle with you. Please have mercy on us; permit us to raise our arms against you." Bhîshma was naturally charmed and overjoyed at the humility and righteousness of Dharmaja; his eyes were filled with tears at the strange turn that destiny had taken; he blessed him and said, 'Dharmaja! You have stuck to Dharma in spite of the temptations this situation has placed before you. What a noble example you have set before the world! This Dharma that you follow will itself give you victory." Next, Dharmaja and the brothers moved towards General Drona, the Brahmin Preceptor, who had taught archery to both the Kauravas and their cousins, the Pândavas. Dharmaja fell at his feet too and prayed "Highly revered Preceptor! We five are your pupils; how can we rightfully take up arms against our Preceptor? The times have indeed gone awry. Pardon us for this wrong. Permit us to engage with you in battle". Drona the âcârya, was visibly moved by this appeal. "Ah! How great and good, this Dharmaja is! Even at this moment when the hounds of war are to be let loose to spread death and fury, he is sticking to the dictates of Dharma!" Drona was thrilled at the thought. He clasped Dharmaja in his arms and said "Son! You are dearer to me than As'vatthâmâ, for I am drawn to him only by duty, whereas I am drawn to you by love. You are all my sons, for, I love you as such. Your Right will certainly earn victory over might. It is this adherence to Dharma that ensured their victory. Shower ânanda on others; lead them along the godly way; be an example in sincerity and earnestness. Partake in Bhajan and Namasankîrtana; have share in the singing, loudly and with enthusiasm. Some ask me, "Why should we sing aloud? Isn't it enough if we feel it in the silence of the mind?" This is mere dry Vedanta! They are prepared to advise others in the samithi, but, are unwilling to practise the advice themselves! Two friends were remarkable for their sloth; one of them had to catch a train at 3 A.M. So, he asked his friend to wake him up at 2.30 A.M. for he had no faith in himself. The friend was even more of a sloth! He wanted that he should be awakened by his friend at 2.15 A.M. so that he could wake the same fellow at 2.30! How can anything be accomplished by such men? S'iva is the supreme exemplar of serenity! S'iva according to the Purânas, has a curious assortment of family members. Yet, each one is so calm and without agitation, that the Divine Family exists in peace and concord. S'iva has snakes on His arms, round His neck, on His head, around His waist! One of His sons, Kumara rides on a peacock, which attacks snakes; another rides on a mouse, which the snakes feed on! One son has the head of the elephant, which whets the appetite of the lion, which is the vehicle used by Dûrga, the consort of S'iva, who is so inseparable that she is the left half of the body of S'iva Himself. Nor is the lion friendly by nature to the bull, which Lord S'iva Himself has as His vehicle! S'iva has fire on the central point of His brow, and water (the river Ganges) on His head - incompatibles both! Imagine how loving, how cooperative the various components have to be to render life on Kailas smooth and happy? It all depends on the mind and its proper discipline. The weapon of love will disarm every opponent. Love begets love. It will be reflected back, it will have only love as reaction. Shout 'Love'; the echo from the other person's heart will also be 'Love'. Once it happened that Krishna, Balarâm and Satyaki who were quite little boys at that time, scarce four or five years old, strayed into a thick jungle, all alone, when darkness fell, and there was no way of reaching Gokulam! 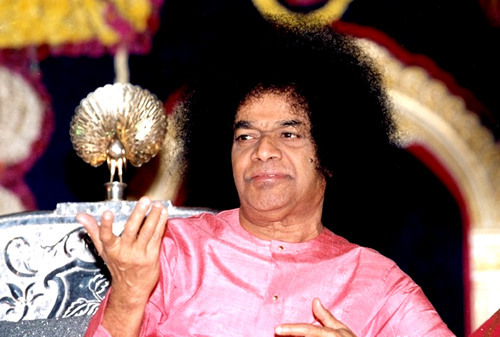 Of course, as you must have guessed already, it was a stratagem of Krishna; even at that age, he would do nothing without a deep purpose behind it and the purpose would invariably be teaching some one some good lesson. They decided to spend the night, just where they were; Krishna put fright into them with his descriptions of ghosts, ghouls and demons roaming in search of human prey. He proposed that two shall sleep for three hours at a stretch while the other one kept watch. It was Krishna's duty to keep awake and be on the lookout from 7 to 10; Satyaki was to be vigilant from 10 to 1 A. M. and Balarâma was to start his part of the duty at 1 and keep on till 4. Satyaki sat up at 10 and Balarâma and Krishna laid themselves on beds of dried leaves and slept soundly. Meanwhile a demon did actually present himself before the little Satyaki. He fell upon the boy, who resisted heroically, dealing and receiving hammerstrokes with fists with a good number of clawing and biting in between. The demon had to retreat at last, leaving Satyaki badly mauled, but happy. The two brothers were sound asleep; they had not been disturbed in the least by noise of the encounter. Satyaki had met blow with blow, and dealt injury for injury. At 1, he awakened Balarâma and stretched his body on the heap of leaves, as if nothing had happened. The demon invited Balarâma too for combat and had to retreat humiliated, because Balarâma too was as fierce as he, and his blows were even more terrible than Satyaki's. Balarâma too curled himself into the bed at 4 A. M., after waking up Krishna who was to keep watch in Brahmâ-muhûrta, the auspicious hour when Gods are to be propitiated, that is, until dawn. The demon came roaring like a wounded tiger, and advanced ferociously at the little Divine Boy. Krishna turned his sweet charming face at him, arid rewarded him with a lovely smile. That smile disarmed the demon; the longer he came under its influence, the weaker became his vengeance and venom. At last, the demon became as docile as a lamb; when the other two woke, they were surprised at the victory that Krishna had won by the weapon of Love. You cannot destroy anger by anger, cruelty by cruelty, hatred by hatred. Anger can be subdued only by forbearance; cruelty can be overcome only by non-violence, hatred yields only to charity and compassion. Bhîshma was a mighty warrior; he was famous for the grandeur and glory that he won, through both detachment and divine grace. In the vicinity of his kingdom, Bhîshma once had to encounter a person called Cakradhara. This man had undergone severe austerity and received from God as a reward for pleasing Him, an invincible discus (cakra, wheel), so people hailed him as Cakradhara, the wielder of the divine wheel-weapon! The fellow had become so insolent and wicked that he wrote a most insulting missive to Bhîshma, on the death of Shantanu, Bhîshma's father. Cakradhara wrote, "Either send the widowed queen to my palace-zenana or meet me in battle"! Who could tolerate such insults and keep quiet? It is said that everyone has to guard dharani (land), dharma (faith) and dharmapathni (wife). Bhîshma said to himself. "What is my life worth if I cannot avenge this insult, if I cannot save my mother's honor?" But, the brahmins of the court advised him that he should engage himself in combat with Cakradhara, only after ten days; for, during the ten-day-period after the death of his father, he had ceremonial pollution and during that period, he should not handle the divine missiles he had with him. He could not utter then, the holy mantras which can activise them. "Finish the religious rites to appease the departed soul of your father and then, destroy the foe in battle", they advised. Bhîshma realised the propriety of their counsel and sent a message to Cakradhara, inviting him for the fray ten days later! There is the story of a young man who was riding a cycle on a dark night along a crowded road; the policeman on duty asked him to stop and alight, for, he had no lamp on his cycle. The fellow, however, shouted, "policeman, keep away, of course, I have no lamp; but, beware, I have no brake, either!" That is the pathetic condition of everyone now. No one has the lamp of wisdom, or the brake of sense-control. How then can they go along the road to Ânanda, without causing injury to themselves or others? The cyclist must have both; man too has need of wisdom and self-control. Or else, he is certain to ruin this chance he has got, to save himself. When you speak with the tongue or see with the eye, or plan with the brain, who is it that speaks, sees, judges and decides? It is the One Intelligence, the One that, like a current works in and through all men and materials, God. When you are immersed in Bhajan, note who the One is activating you! Your tongue pronounces the words in the tune designed for them; your palms beat the time; slow or fast; your head sways in unison with the sentiments that the words express; your mind is gushing Ânanda, at the magnificance of the pictures that the song evokes. So too, a dancer is articulating harmony and melody through every gesture and movement of muscle and limb. But, all the activity originates from a common source, God, who is resident as President in the heart. When he is ignored, neglected, or denied, there is no joy for you or through you for others. You are either thamasic-dull, inert, or rajasic, passionate, fanatic, but not satvic-pure, balanced, serene! God is All. He is all Forms, His are all Names. There is no place where He is not; no moment when He is not! (even the devil has the syllable dev, to indicate his affinity). Thunder is God's message; the rain is His Grace. Let no second pass without awareness of God; let no event lapse without reminding you that He is the artificer! You have an image or picture in the room you have set apart for worshipping God. You light a lamp before it! You say, 'I have lit the lamp'; but, is it you really? Who endowed the oil, the wick, and the lamp, the property of producing a flame together? Who moved you to revere the picture in this form? Who was it that placed the lamp, lit it and bowed before the picture? It is all God, God, God. There is none else, nothing else, for the man who knows and feels. Brahmâ-muhûrta: period of one to one and a half hour before the (mean time of) sunrise. Time most suitable for meditation.